How the Dog Safety Expert Got Bitten! As a dog trainer, who specializes in teaching bite prevention to kids, the irony wasn't lost on me when I was bitten by a dog. When I told them, my friends and family asked how it could have happened to me. Honestly? VERY easily. I did some things right, BUT one thing totally wrong — and that ONE slip was all it took. 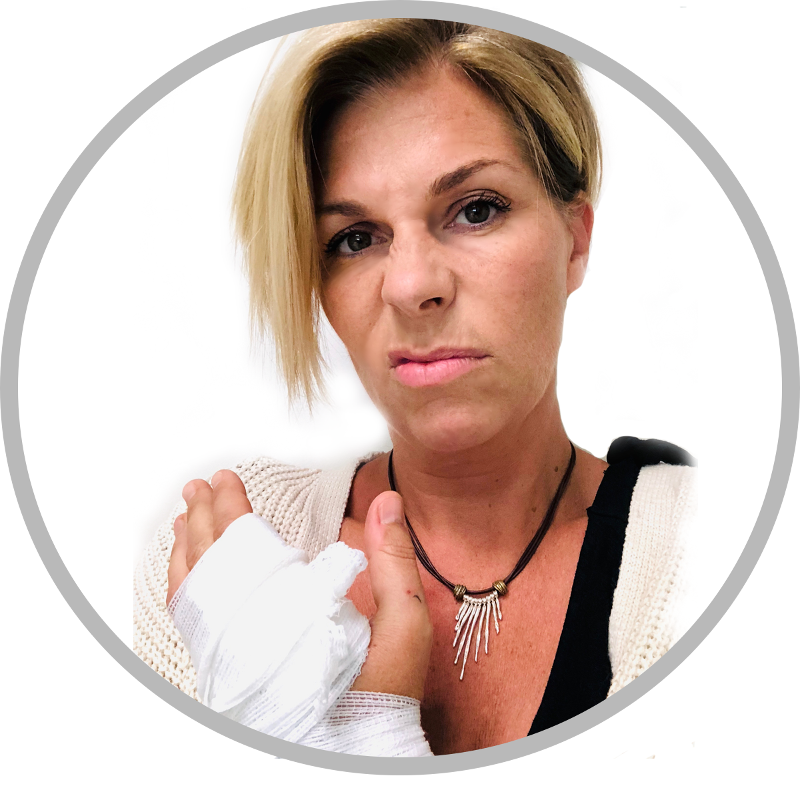 However… never one to let an opportunity (or bloody hand) go to waste, I want to share my story — in the hope that maybe I can stop something like this happening to you and those you love. It was a Tuesday. Kids were dropped off at summer camp and I was taking a walk around the park with two of my dogs, Cam (35lbs of sweetness) and Zig (10lbs of tough!). Close to the end of the walk, I spotted LADY #1 about 100ft away, with her 60lb lab mix who started barking at my dogs. After years of having owned a reactive dog, I intimately understand how difficult it can be to wrangle one — so I gave her a REALLY wide berth as I passed by. My back was to her as I heard a scream come out of her dog. I turned quickly to see what was happening, only to watch her pinning her squealing dog. For a split second, I was concerned that she was punishing her dog for lunging at mine — but she wasn't. Instead, she was frantically trying to hold her dog down, while simultaneously struggling to put a collar back on – which, apparently had managed to slip off. Enter LADY #2, who passed by LADY #1 WITHOUT a wide berth — totally unaware of just how much worse the closeness made it for the now pinned–and–wriggly–reactive dog. I hate seeing anyone in trouble, so I kept lookout from a distance, to make sure there was no drama. Within seconds, the dog was back in the collar and they were good to go. Phew! As I walked away from the scene I heard SH*T!!! I whipped my head around to see the dog out of its collar AGAIN and making a beeline for my dogs. I'm not going to lie, it was scary. There was NO TIME to think. All I could feel was the adrenaline surging. Without thinking, I scooped Ziggy up, but had to leave Cam on the ground to hold her own. I immediately stepped in front of her, to break the speed and intensity at which the dog was charging at us. I left Cam's leash loose, so that she was free to move at her own will. The loose dog and Cam just sniffed each other - and my blood pressure dropped a few points. But it was momentary. Within 3 seconds, there was a LOT of noise and the dog had Cam pinned to the ground and was biting her. IT WAS HORRIBLE!!!! Cam had literally crumbled into a heap on the ground, under the bigger dog. I clutched feisty little ("I CAN TAKE HER!!") Zig in my arms for dear life — terrified of what would happen to him if he got free. Meanwhile, *knowing* NOT to use my hands, I tried to move the dog off Cam's body with my feet. For a split–second, there was a break in the fighting and I felt the overwhelming urge to do SOMETHING to help Cam. CUE MY BIG MISTAKE: I reached my hand down to pick her up, move her out of the fray... ANYTHING!! Definitely not a well–thought–out plan — but I couldn't stop myself. In that nano–second, the other dog lunged and bit my hand. I didn't even feel it at first. It's possible that she was going for Cam and got me by mistake — but I don't think so. Dogs are very intentional when they bite. I'm pretty sure it was a redirected bite: she was jacked up, my hand entered the scene and she didn't want it there. Simple as that. THANKS FOR HANGING IN… WRAPPING IT UP NOW! After what felt like forever, the lady got hold of her dog, and I made a swift exit, behind a bush many feet away. Cam was crying and had blood on her face. Zig was still letting that dog know that, given a chance, he could take her! I helped the woman make a make–shift collar out of her leash so that she could get her dog to the car safely, and we exchanged information. I checked Cam over thoroughly. Luckily, the blood on her face was just my blood. To this moment, I can hardly believe that she escaped without a mark. Well, physically, but likely not mentally. And my bite was just ONE puncture. Just because of one badly-fitting collar. Looking back, it's amazing that even as a dog trainer who KNOWS better, in the heat of the moment, the instinct to save my dog when I heard her scream TOTALLY over-rode my instinct to do the SAFE thing. I’ve had time to think about this now. What I 'coulda-woulda-shoulda' done and what tips could I share with the world – and honestly, it’s pretty murky! It’s hard to be definitive when every situation will be so different. The good news is that it's HIGHLY unlikely this will ever happen to you. This was a perfect storm – with an intentional attack - and these incidents happen SO rarely. My 18 years of fight-free walks definitely backs that up! Do everything to resist the temptation to get in the middle of the action. There is a huge chance you or a family member will get hurt. Even professionals, with a ton of experience have been seriously injured breaking up a fight. The heat can be seriously taken out of a brawl by pointing a hose on the dogs or covering them with a blanket or coat. Just one caveat - it's highly unlikely you'll be strolling the park with a hose in tow, I know... but for a backyard or dog park - it's a great option! Consider carrying a small canister of citronella – only to use in emergencies. This can be an effective (and practical) tool if a fight kicks off. It smells and tastes gross – but there are no long-term effects for the dog on the receiving end. 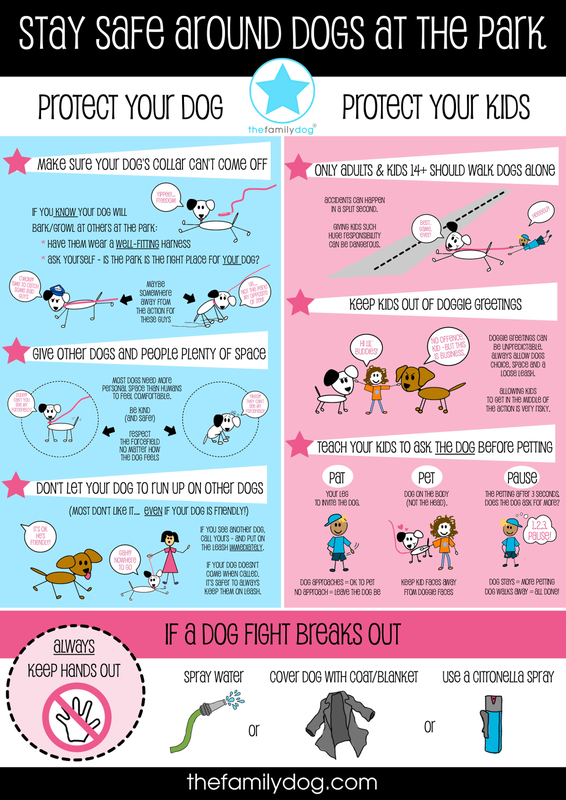 While we may not be left with many options if our dogs get into a fight, there ARE plenty of ways that everyone can do their part to PREVENT something like this happening. So… da da da!! Here’s The Family Dog’s LATEST infographic to help YOU and YOUR FAMILY stay safe at the park. My hope is that after reading this, and studying the poster, you will be equipped to do your best ‘defensive driving’ at the park and avoid any doggie drama. Also, if you haven’t already been there – head IMMEDIATELY to our DOG SAFETY PAGE and learn all the ways you and your kids can stay safe (and HAPPY!) with your dog. 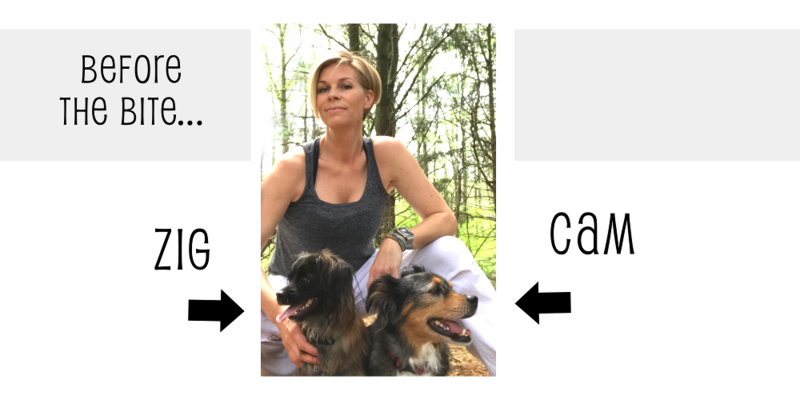 Special thanks to the amazing Adrienne Carson @ Liveandlearndogs.com for always being my aggressive dog guru.